For those unfamiliar with Dutchman Tim Krabbé's "Open Chess Diary," you're missing some entertaining chess lore. The Chess Drum featured one such story about Archie Waters, a Black companion of Bobby Fischer. 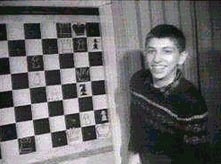 Entry #28 (30 October 1999) has another story about Fischer, this time as a 14-year old phenom from Brooklyn who dazzled the world with his chess wizardry. In the featured game, Fischer finishes off an beleaguered opponent with an array of tactics highlighted by a nice Queen sac. No it isn't the famous D. Byrne- Fischer game (New York, 1956), but Fischer-Sherwin from the 1957 U.S. Championship. A few notes and an extra diagram have been added. Now Krabbé makes the call! Enjoy! In that documentary 'Clash of the Titans' (see item 27), there was also some footage of Fischer I had never seen: 14-year old Bobby at a demonstration board, showing a position I recognized as Fischer-Sherwin from his first American championship. At the time it was analysed extensively in Holland by Kramer and Crabbendam, whose findings have perhaps not yet entered the Fischer-story. 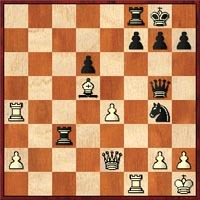 30.Rxf7 A great coup, probably the best move, but perhaps not winning. 30...Rc1+? Falls for the trap. Of course 30...Rxf7 was not possible because of 31.Ra8+ and mate, and 30...Qxd5 31.Rxf8+! (31.exd5? Rc1+ and mate) Kxf8 32.Qf1+ Qf7 33.Ra8+ Ke7 34.Ra7+ loses by force. 30...Qc1+ is met by 31.Qf1! (not 31.Rf1? Kh8 and Black wins) and White wins after a funny cascade of pins, e.g. 31...Rxf7 31.Ra8+ Rc8 32.Bxf7+ and 33.Qxc1. Best is 30...h5. White then has a couple of ways to go astray: 31.Rf3+ Kh7 32.Rxc3 Qd2 33.Bc4 Qxc3 and Black wins, or 31.Rf5+ Kh7 32.Rxf8 Rc1+ 33.Rf1 Qf4, also with a win for Black. 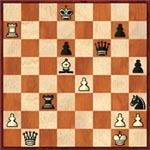 Unclear is 31.Qf1 Kh7 (31...Rc1? 32.Qxc1 and 33.Rf1+) 32.Rxf8 Rc1. After 30...h5, White's best try is 31.Rxf8++ Kxf8 32.Qf1+ Qf6! (after 32...Nf6 33.Rc4 Rxc4 34.Qxc4 Nxd5 35.exd5 White wins the queens ending) and now White must try his luck in the watery endgame after 33.Ra8+ Ke7 34.Ra7+ Kd8 35.Rf7 Qxf1+ 36.Rxf1 because, as Crabbendam showed, the attack with 35.Qb1 in that variation doesn't work: Black draws with Nf2+ 36.Kg1 Nh3+ enz. (37.gxh3? Qg5+ and Black wins.) End of variation. After Sherwin's 30...Rc1+, 31.Rf1+ would lose (31...Kh8 32.Ra8 Rxa8 33.Bxa8 Qf4), but Fischer had the cunning 31.Qf1! up his sleeve, the move he's just played on the demonstration board. 31...Rxf1+ 32.Rxf1+ is not possible, and the double threat Rxf8++ and Qxc1 finishes the game at once. There followed: 31...h5 32.Qxc1 Qh4 33.Rxf8++ Kh7 34.h3 Qg3 35.hxg4 h4 36.Be6 and Black resigned. The smile with which he shows this devilish 31.Qf1! is open, and winning.